I admit it, mathematics was not my favourite subject in school. In fact I was the weakest student in my class. My teachers changed as I moved up and all of them insisted that I give up trying to conquer the subject. I didn't, I managed to somehow slay the dragon and survive my school and college days. But now the math dragon has reared it's ugly head again - which one has the greater value? 3 or 4, sounds simple doesn't it? But the 3 and 4 here refer to the BMW 320d and the Audi A4 2.0 TDI. These two German manufacturers are fighting tooth and nail for the top spot in the Indian luxury car segment and its these two models that bring in the numbers. So which is the better car? The 320d or the A4 2.0 TDI? We drive 3000km to solve this question. The 3 Series is the newest car and is also the better looking of the two. The unique front end is unlike any BMW, the headlamps blending with the kidney grille and the swooping front nose differentiates it from its bigger siblings. The rest of the car follows a design language similar to the larger and attractive 5 Series. The A4 has been around for a while now but the 2012 model received a mid-life facelift. A new hexagonal front grille, sharper headlamps and an all-new bumper gives the car a mini-A6 look. Both the cars feature DRLs, the 3 uses typical corona rings that are no longer circular while the Audi boasts of a tron-like edgy pattern that draws a lot of attention. Moving to the sides and rear, the 3 is definitely the smarter looking car. The side profile is an evolution of the previous generation car and is well proportioned too, the sides of the Audi haven't changed and is now beginning to look dated. From the rear, the 3 looks smarter and it is this angle that resembles the 5 Series the most. Except for newer tail lamps, the rear of the A4 hasn't changed much. However it does look sporty. The interiors of the 3 Series is similar to most BMWs, the simple no-nonsense dashboard is uncluttered and well thought of. The centre console is tilted towards the driver while the beige black dual tone colour gives the interior a clean look. However beige is prone to getting dirty easily. The various control knobs and switches are well within reach and the large iDrive screen gives the interior a contemporary look. But other than the screen the interior hasn't evolved much from the previous generation car. The A4's cabin in comparison is brighter thanks to the brown and beige colours. The centre console looks aged and desperately needs an upgrade. There are more buttons in the car too. Fit and finish is as good as in the BMW. The Audi MMI screen is also large and clear but the system is less user friendly. In terms of space and comfort, it's the 3 Series that offers better comfort up front, the seats offer more support too. The A4 seats are however softer. Both cars even offer similar space up front. Since these cars are chauffeur driven in India, space at the rear is a deal breaker. The new 3 Series has grown and as a result offers more knee room and space at the back than the A4, the older 3 was known for poor rear passenger space but it's the Audi now that's feeling the pinch. In terms of boot space, both cars offer 480 litres but the Audi also gets a spare wheel. Both cars displace 2.0 litres and both borrow engines from the older model but with tweaks. The result is more power and at the same time better fuel efficiency. The BMW however is more powerful, the engine produces 181PS at 4000rpm and 380Nm of torque from 1750-2750rpm. The Audi in comparison produces only 141PS at 4200rpm while peak torque is 320Nm produced between 1750 and 2500rpm. In terms of refinement, the A4 scores over the 3. The engine is much quieter too and at times let's you think it's a petrol. Power delivery is much more linear and feels adequate for cruising on the highway and driving in the city. The BMW however is much more responsive and higher revving than the Audi and better suited for spirited driving. Both engines are mated to an 8-speed gearbox. The BMW features a torque converter that is as quick to shift as a twin-clutch unit, the shifts are smooth and seamless too and never feels jerky. Manual shifts are responsive and there is hardly any lag. The Audi on the other hand features an 8-speed CVT, it too shifts quite smoothly and sometimes makes one think if it's actually a torque converter inside. However, in kick-down mode there is transmission lag common to CVTs. In terms of performance, you get no points for guessing which one is better. The 320d completely outperforms the A4 2.0 TDI. The dash to 100kmph comes up in just 7.81 seconds, that's a full three seconds quicker to the A4. In kickdown mode, less transmission lag and more torque means the BMW does 40 to 100kmph in 6.02 seconds, the Audi in comparison takes 7.75 seconds. The quarter mile run is covered in 14.61 seconds, 3.01 seconds quicker than the A4. Top speed is also much higher, the 320d maxes out at 211kmph while the A4 runs out of steam at 200kmph. In terms of efficiency, it's the BMW that returns more to the litre. On the highway the car returns 22.1kmpl while the A4 returns 17.4kmpl. In town the car returns 14.2kmpl, 1.40kmpl more than the Audi. This translates to an overall figure of 16.18kmpl and 13.95kmpl for the BMW and Audi respectively. 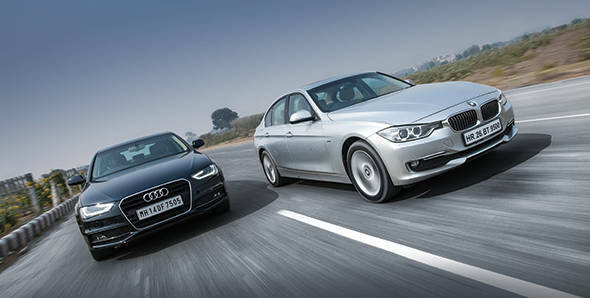 The 320d then comprehensively beats the A4. The 3 also offers three driving modes. We tested the car in comfort mode. In the Eco Pro mode, the car is claimed to lower the fuel consumption by a further 20 per cent by altering the car's gearbox shift pattern, engine map and air conditioning system. The 3 Series has become softer than its predecessor but it is still stiffer when compared to the A4. On our drive on various expressways and broken roads, the A4 felt more comfortable at cruising speeds since it soaked the bumps better. However as speeds increased, the car wallowed and rolled more than expected. The 320d is the softest BMW sold today, with four people and their luggage the car did wallow and at times even bottomed out but it still scores over the A4. It may not offer the best ride quality but at higher speed the car is better planted and more confidence inspiring than the Audi. The front-wheel drive A4 loses out when pushed hard and understeers more than expected, it is not as balanced as the sporty BMW. Both the cars now feature electric power steering. The BMW steering is much lighter than before making it a boon to park and drive at lower speeds however the Audi's steering has become even lighter and is still the easier car to drive. At the end of our long drive, the A4 was more relaxed to drive than the 320d while driver fatigue was minimal. However the light steering doesn't weigh up much as speeds increase and there is hardly any feedback, that's the trade-off you get with Audi's light steering. The 3 Series steering on the other hand weighs up well at higher speeds and offers the best of both worlds. The Audi S line and BMW's Luxury variant are equally matched in terms of features. Both the cars offer a lot of equipment as standard. In terms of safety, both cars get eight airbags. Reverse camera is standard too but it's the BMWs display that offers a better resolution. The 320d also scores over the A4 by offering a fully functional navigation system that came in handy in our drive, we used it to find places to stay and eat and even find nearby fuel pumps. The A4 gets a navigation system as well but it doesn't work in India since there is no pre-loaded map data. The A4 will get you from point A to B in style, and its ease of driving makes sense with the ever growing traffic in most Indian cities. The engine is quiet and refined too. The facelift has given the car a fresh new look but that's not good enough here. The 320d scores over the A4 in almost every other aspect. It offers more passenger space, handles superbly, is much more powerful and at the same time more efficient and, most importantly, looks stunning. It's definitely the better car overall and the extra Rs 1.9 lakh is worth it. When the new A4 comes late this year, the equation might just change, but for now, contrary to convention, 3 is greater than 4.